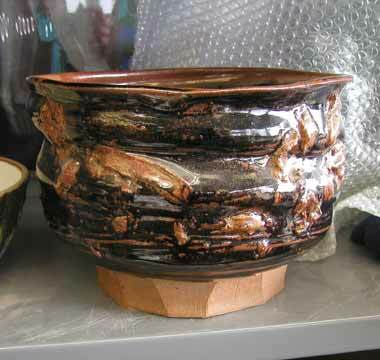 I, like you I suspect, would like to see some finished pots for a change. I am still two months away from that. 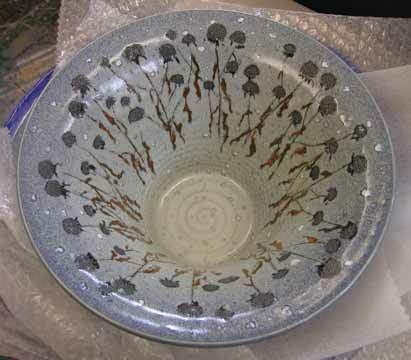 However, I go have some finished pieces to show you. 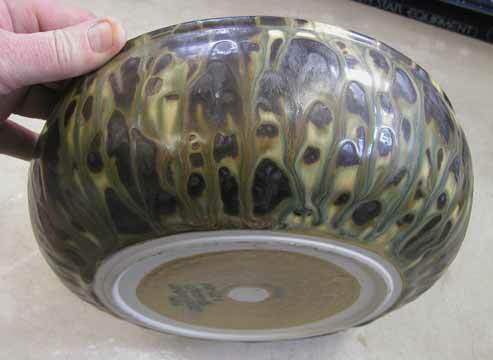 These are some of my favorite bowls that I have kept through the years. They are not for sale. 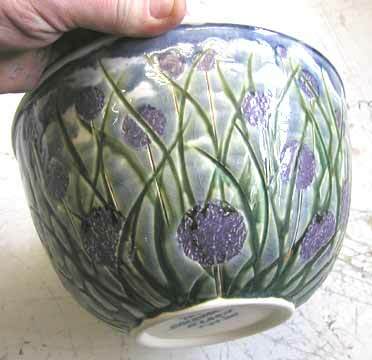 I thought you might like to see them since many of them have themes on them that also appear on my pots. This first one is a drawing of Comet Hale-Bopp passing over the neighborhood. 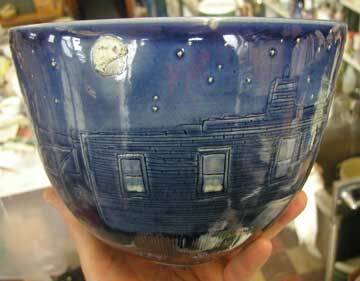 I actually did this drawing on this bowl outside looking at the comet which is in the glare above the tree on the right. The drawing is a little crude since it was done on the spot. 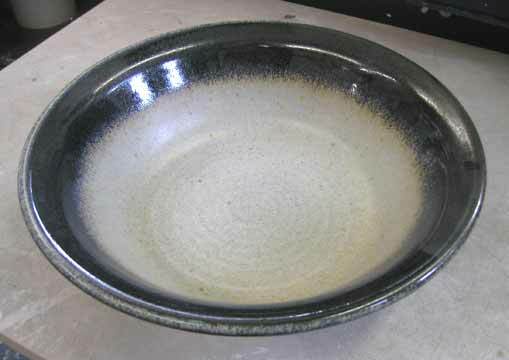 I made three more similar bowls that are more "practiced." I still have them all. 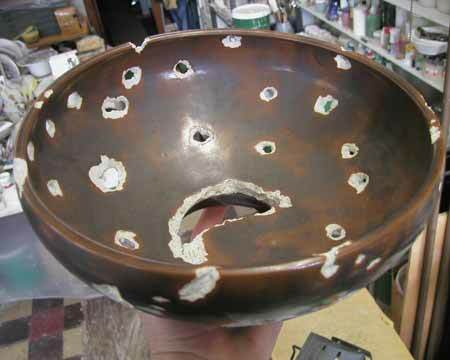 A "Chechen Victory Bowl." Ever see the city of Groznyi after the Russians came through? The city looked totally destroyed and useless. 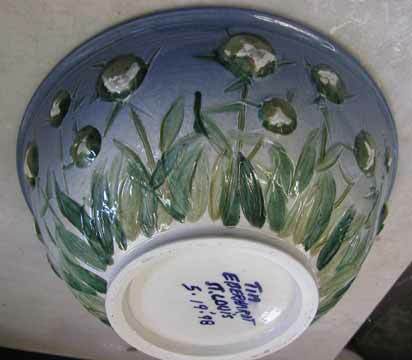 This is one of my "history pots." 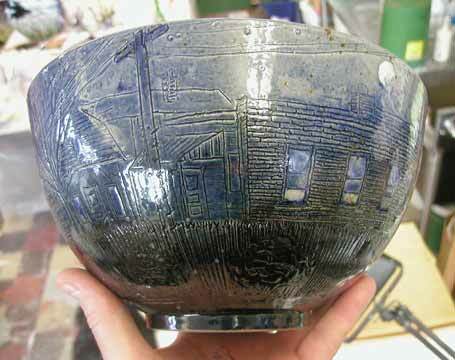 I sometimes make pots that reflect the news-of-the-day. 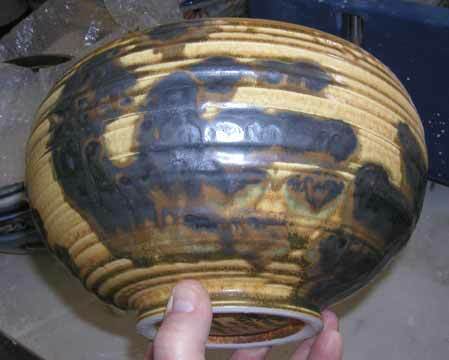 The first bowls I ever made. You can see I was enthused with the look of clay spinning between my fingers. 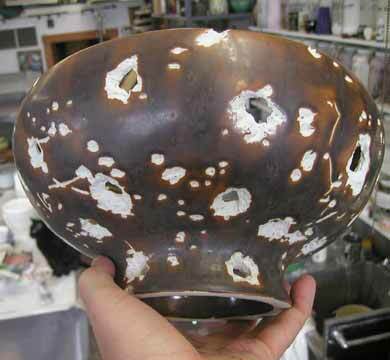 Here is one of the more "practiced" Hale-Bopp bowls. The drawing just shows the scene in the alley behind the studio. Again, the faint comet is on the top right of the right-hand picture. 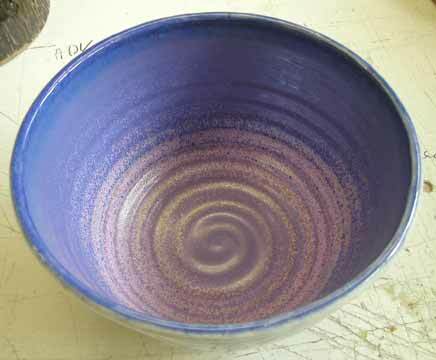 This bowl is one of the most beautiful things I have made of late. 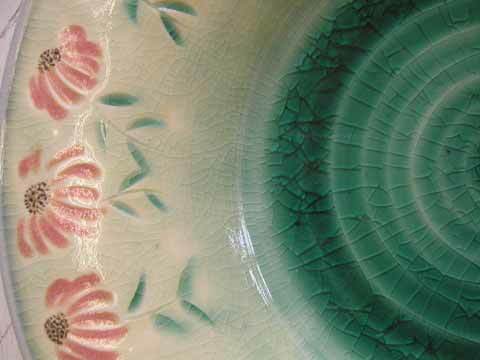 You are going to see this theme and glazes on a number of pots this year. 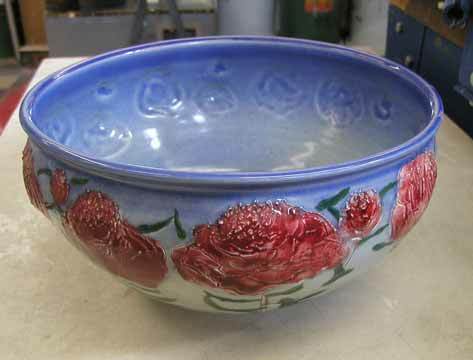 This is a 17" bowl decorated inside and out. 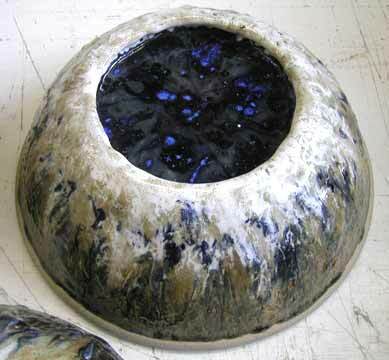 The "crazy crystal glaze" is on top of the drawing here. Here is the Peony flower just as the flower is about to open. This is the first of a set that shows the life cycle of the flower. 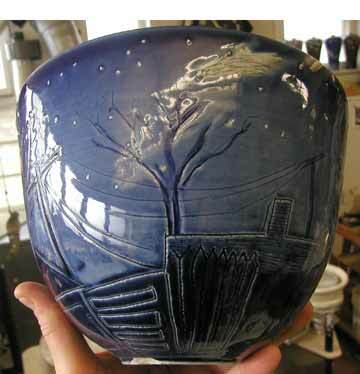 I am toying with the idea of refiring this one this year. Breath a little life into it. 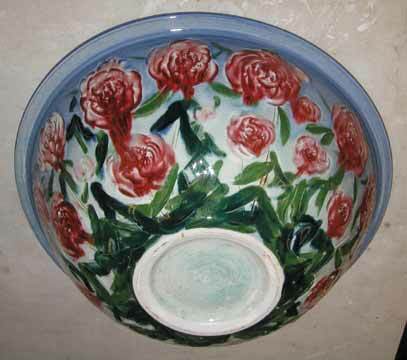 Here is another Peony bowl when the bush is in full bloom. 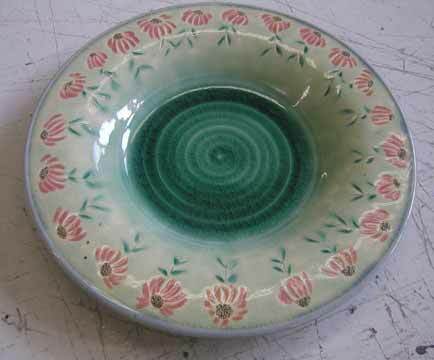 The reds on these bowls are copper reds- a vivid, reduction, pigeon-blood red. The inside is offensively plain. Nowadays, I always strive to make both sides equally as interesting. 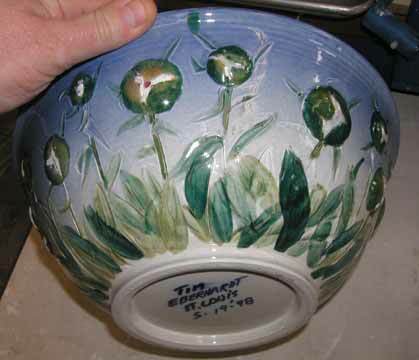 I make Peony pots every spring. 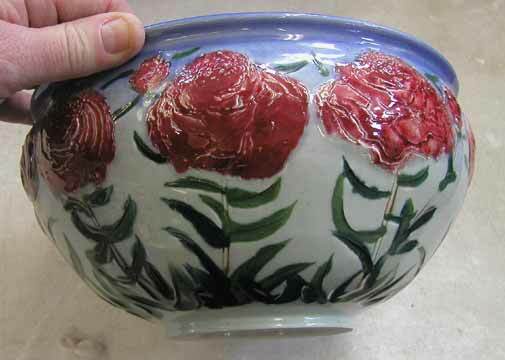 I have made a lot of Peony bowls. This is the second last of the set and shows the bush weighed down by the huge flowers. 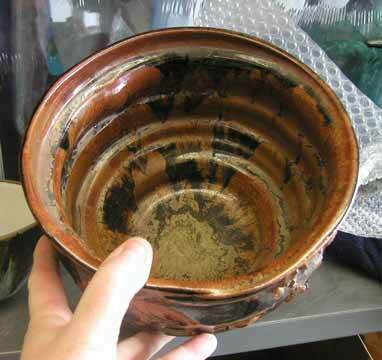 This is another bowl meant to be stored as a piece of sculpture when not in use. 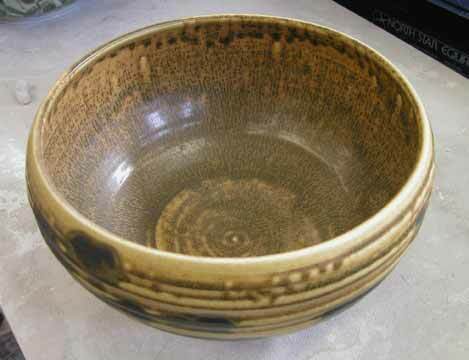 I do make "plain" bowls as well. This is how I often decorate them- just a colored band around the top. 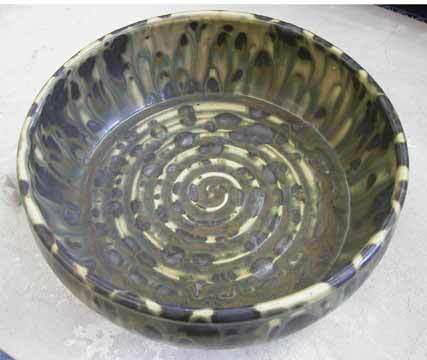 This bowl is called "The Hands of the Maker" and I dip my hands in black slip and pick the bowl up. 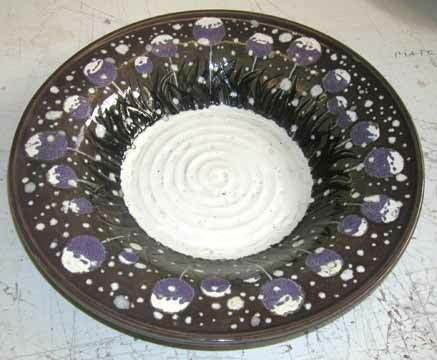 Then I glaze over the whole thing and have ghostly handprints in the glaze. 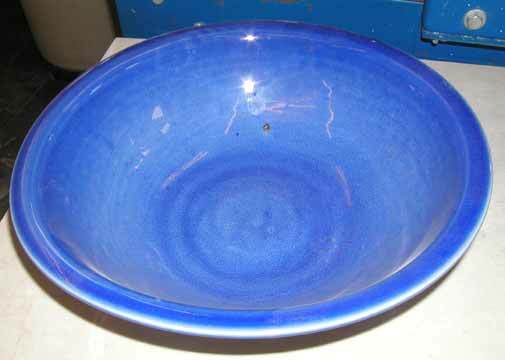 I am part of the bowl! 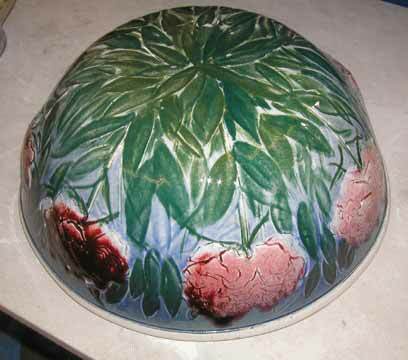 One of my first Peony bowls. 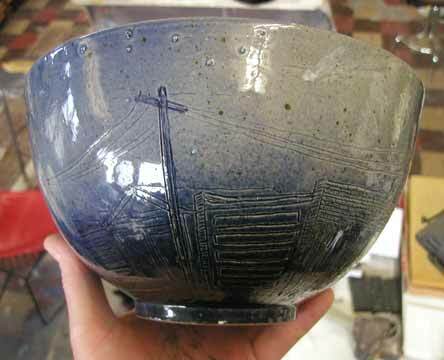 Might as well call this bowl "The Fingertips of the Maker." 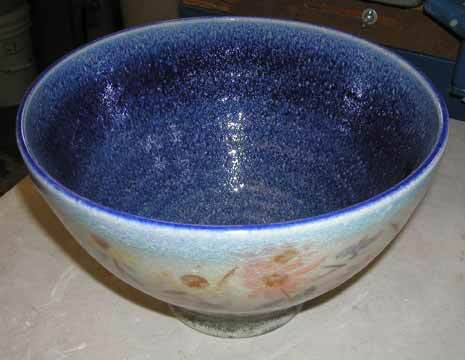 Actually, my son underglazed this bowl. I turned him loose and let him put the slip on anyway he wanted. I follow his technique often now. 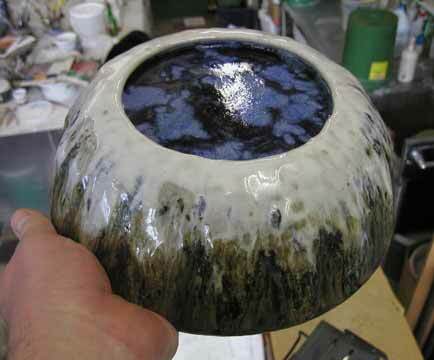 This is a wonderful glaze and glaze technique. 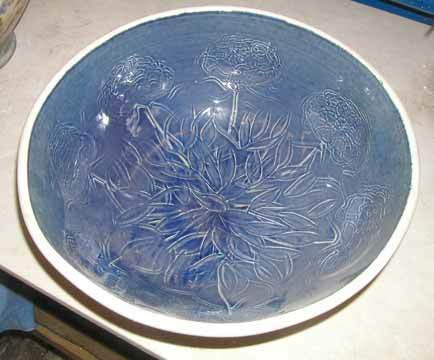 The bowl on the left is an 18" "Snow on Alium" bowl. This must be one of the first times I used the falling snow themes. 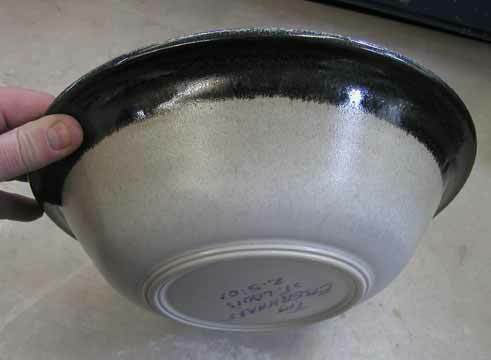 This pot has been around about three or four years. Some of you might remember it from Zanesville one year. I brought it up there; nobody wanted it; it's mine forever. 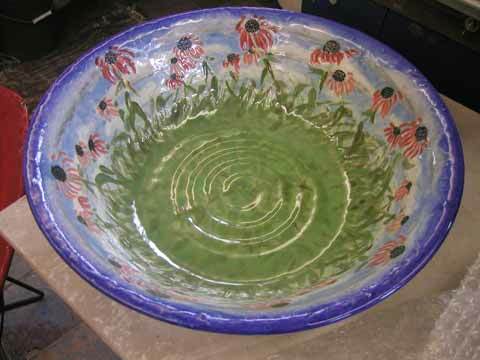 On the right, a companion bowl-same size- "Aliums in the Wind." 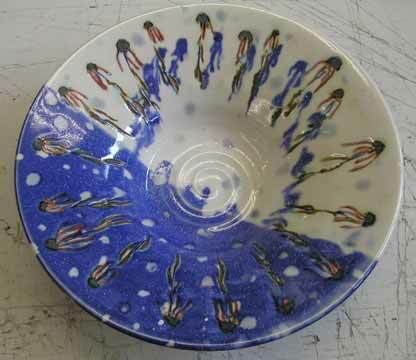 Here is a group of those "landform" bowls. They are sort-of a set. This is one of the best I have made. My buddy, Ed Henderson, bought it right away before I had time to think about it. 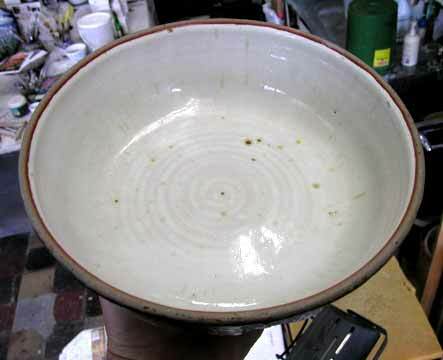 I would go to visit him and always lust after this bowl. (Like I can't make another, right? Well, I CAN"T!!) 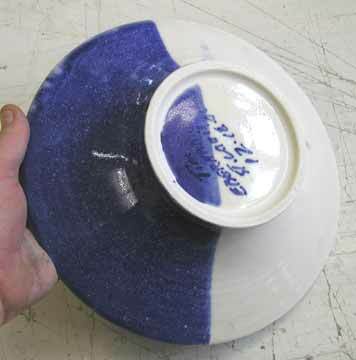 Well, Ed sold it and 49 other pieces of my pottery back to me just before he died. I miss him. This is another killer piece. It's a light and shadow on the snow theme and I am using it a lot this year. 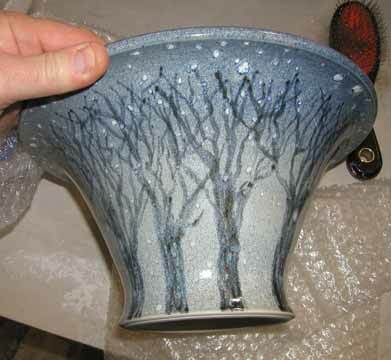 This is my defintion of a beautiful piece. Hope you enjoyed seeing something different. Back to the same old thing next update.